No matter how much of a political junkie you are, you must surely have had enough of the spectacle that is the 2016 campaign for the presidency. At current count, we are faced with an astounding 15 candidates for the Republican nomination, one of whom is doing his best to revive the ugliest nativism of the 19th century. On the other side of our binary party system, we have only One. Or so it would seem if you were to pay attention to much of the media coverage, which only rarely mentions the handful of other Democratic contenders and mostly ignores the rising tide of support for Bernie Sanders. —aren't the birds frozen socialists? 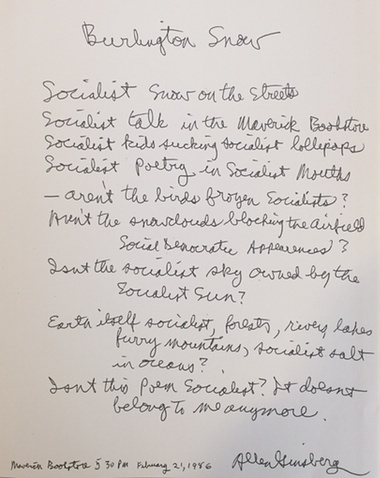 Calling it “Burlington Snow,” Ginsberg composed the poem—equal parts goofy and sincere—on a visit to the city, one of many pilgrimages made by left-wing writers and artists after Sanders' string of attempted foreign policy interventions. You can read all about the optimistic socialist—or democratic socialist, or whatever—in Paul Lewis’ Guardian portrait. Not “appeasement” but “appearances”, right? I’ll thank you for correcting this. Noted and corrected. Thanks, David. Well, even Allen had his off days. And plenty of them! But this is not meant to be read as “serious work.” Surely an imminent literary critic like you picked up on that?